The classic story of how a beaver and a lumberjack become best friends--the lumberjack being a little girl with a chainsaw, of course! Fred has built a den. But not just any den. His DREAM DEN. Problem, it's missing one small thing... Maybe the roarrrrringly cool lumberjack he meets in the woods can help! "The best beaver/lumberjack friendship in children's literature history... Friendship, Woodworking. Chainsaws. What's not to love?" "Weinberg’s colorful cartoon illustrations are full of bug-eyed facial expressions, clever background details, comical slapstick, and a dynamic sense of movement, along with boldly printed onomatopoeia. Themes of friendship, loneliness, cooperation, and problem solving are smartly covered in this quick read...This story is perfect for shy kiddos who have difficulties building friendships." "Move over Paul Bunyan and heads up crafty kids, Weinberg's little lumberjack has an ax, a chainsaw…and a friend." - Lisa Brown, Author/Illustrator of The Airport Book, and many more. "I laughed. I cried. I bought a chainsaw." "RROARR!!! Move over Paul Bunyan! 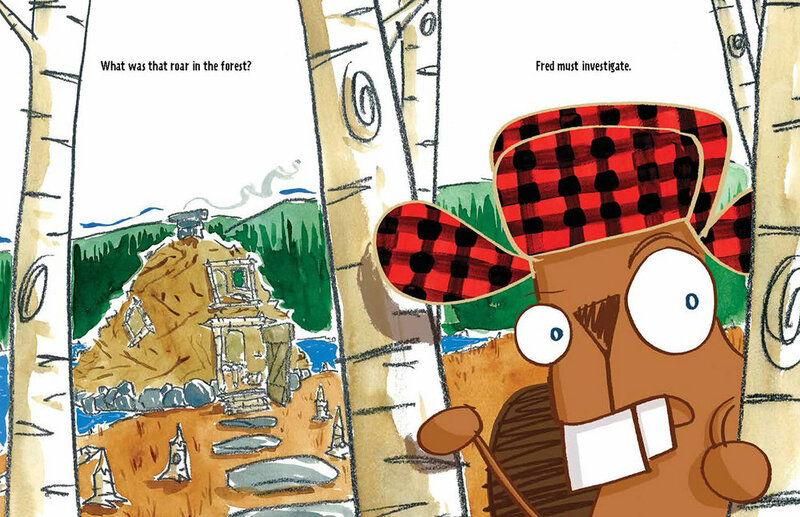 Two new logger legends are born in Fred & the Lumberjack written and illustrated by Steven Weinberg. These plaid-clad champions look at trees and create architectural wonders using the tools of their trade, teeth and chainsaw. This walk in the woods will have you grinning nonstop from beginning to end." "Blending traditional and digital media, Weinberg uses boldly crawled lines and blasts of color to set a scene that’s simultaneously bucolic and chaotic, and his bubble-eyed characters and their outsize emotions and movements add further oomph to an already energetic story." AND chatting children, chainsaws, Catskills dream dens on the AllTheWonders.com Picturebooking podcast with Nick Patton !!! LISTEN HERE. 11/1 10:30 AM - Politics and Prose in Washington, DC.